Enter today and every day through June 11 for a chance to win one $1,000 gift card good on your choice of a premium storm door from Larson! The old adage still rings true today: You don’t get a second chance to make a first impression. And when it comes to your home, the front entry makes the first impression on visitors and guests, so it figures that one of the best ways to ensure your first impression is a good impression is by adding an attractive, durable and energy-efficient storm door. More than just a boost to your home’s curb appeal, a new storm door provides insulation, protects your home from inclement weather, enhances security, and allows natural light in and pests out. To give the gift of better curb appeal, Larson Manufacturing and Bob Vila have teamed up to bring you a special $1,000 Front Door Makeover Giveaway, which will award one lucky winner a $1,000 gift card to be used on their choice of premium storm door. Larson Manufacturing vows to make homes better with a winning selection of storm door and window innovations. 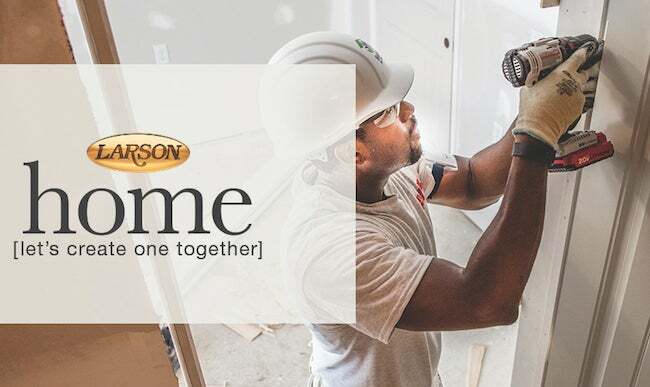 And with this latest giveaway, Larson is helping to make communities better, by awarding a monetary gift to Habitat for Humanity to help that charitable organization provide housing to more people in need. The winner of this giveaway will have a say in how that donation is used by choosing the community to receive the funds, based on a list of locations provided by Larson. Habitat for Humanity is a global nonprofit housing organization working in local communities across all 50 states, building strength, stability and self-reliance in partnership with families in need of decent and affordable housing. Larson Manufacturing was founded more than 65 years ago by Oscar Larson, and has grown from a one-man shop into the largest manufacturer of storm doors and storm windows in the United States. The American-made, family-run company’s headquarters and main manufacturing facility are located in South Dakota, with additional plants located in Iowa and North Carolina. Full View, High View or Mid View: Larson storm doors come in a variety of configurations. Full view glass allows the maximum amount of natural light to come into the home; high view half-glass doors let in natural light on the top while the solid bottom panel provides increased durability; and mid view storm doors feature 2/3 glass for a combination of light and durability. Pet Friendly: Larson’s unique designs allows your pets to come and go through the Retractable Screen Pet Doors with a PetSafe flap. Pet doors are available various sizes to accommodate pets up to 40 pounds; 100 pounds; or 220 pounds. Retractable Screen Away® Design: Larson’s special Retractable Screen Away® construction converts your storm door to a screen door in an instant. The retractable screen provides superior privacy, better insect protection, enhanced solar protection and improved strength. Extreme Weather Protection: Larson’s maintenance-free aluminum frame and overlapping edge seals out harsh weather and keeps drafts at bay. Larson also offers a Magnetic Seal series, which features a magnetic weather strip similar to a refrigerator seal for superior protection against the elements. Unique Closer Technology: Larson storm doors come with your choice of innovative closers: One option, the Hold-Open Closer, has a feature that allows you to hold the storm door open by tapping a button with your foot. Enter Bob Vila’s $1,000 Front Door Makeover Giveaway daily to increase your chances of winning a premium storm door from Larson Manufacturing. To learn more about Larson Manufacturing and to view more of the company’s selection of high-quality storm doors and window products, click here. The Sweepstakes is open only to legal residents of the 50 United States or the District of Columbia who are eighteen (18) years of age (nineteen  for Alabama or Nebraska) or older at time of entry. Employees, officers and directors of Larson Manufacturing Company, Inc. (“Sponsor”), its parent, subsidiary, and affiliated companies, advertising, promotion or production agencies, Web masters/suppliers, and their respective IRS dependents, immediate family members (spouse, parents, children, siblings and each of their spouses, regardless of where they reside), and individuals residing in their same household (whether or not related) are not eligible to participate. By participating, participants agree to these Official Rules and the decisions of Sponsor and/or its independent judging agency which are final and binding in all respects. See Official Rules.